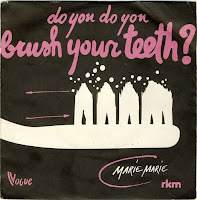 Short sharp kick in the teeth: # 329 Marie Marie - Do you do you brush your teeth ? # 329 Marie Marie - Do you do you brush your teeth ? Side a: Do you do you brush your teeth ? A cool "Plastic Bertrand" sound alike track on the a side by this belgian girl. The b side is more new wave but not bad. I think this was only a studio project and only released in France on the major label "Vogue". I like it this record !! Thank you very much!! Fantastic!! Cheers from Spain.